As the people are yelling, some of the Pharisees in the crowd said to him, “Teacher, order your disciples to stop.” 40He answered, “I tell you, if these were silent, the stones would shout out.” The stones would shout—that sounds like rock and roll to me! What did Jesus mean by the stones would shout? Does it have to do with all of creation giving praise to God? Stones are very quiet when they are just sitting still. The times when I have heard rocks make noise it is usually when they hitting each other—when they are knocking up against each other. The sound that comes to my mind when I think of rocks giving praise would be the soft clunking sound of rounded rocks being rolled together by the end of an ocean wave as it breaks against a stony shore. Have you ever noticed this walking along one of our southern California beaches? Depending on how rocky the shoreline happens to be, the noise can actually get quite loud—almost as if the stones were shouting at you, trying to get you to pay attention to the power of the waves to mold and shape even the hardest rock with the sharpest edges into something smooth and round. 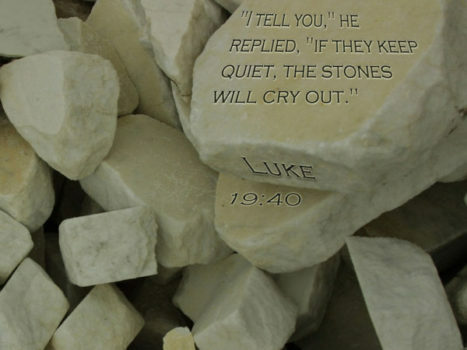 Is this what Jesus meant when he said the stones would cry out? Did he mean that even if we harden our hearts and act as if we are on edge, that God’s creation will get our attention in order to remind us of a higher power that can smooth out our souls so that we too might be able to give God praise? Rocks on the shore make sound as they submit to the power of the waves. Does the lifting of our voices for God’s glory also begin with submitting to the way of Christ in our lives?